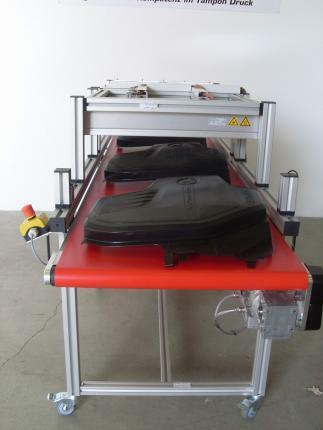 A new addition to our programme is the conveyor belts with integrated infrared drying and cooling zones. The drying intensity is set by means of potentiometers. The drying belt is equipped with up to 3 infrared rays that individually switch on and off. The rays can be manufactured to whatever width is necessary to meet your needs. If necessary, the complete system can be activated by means of a photoelectric beam. If the drying band is not needed, the whole system switches itself off independently, or goes into resting mode. An emergency off switch and protective devices are standard fittings, but the implementation is adapted to your needs. 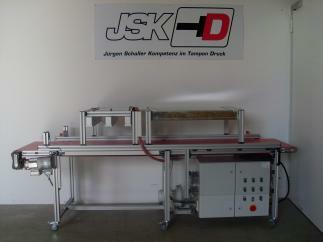 Because of the profile technology used, the whole system can be flexibly expanded. In this case, we have put the whole belt on wheels so that it can be transported quickly and easily to the exact place where it is needed in your business. 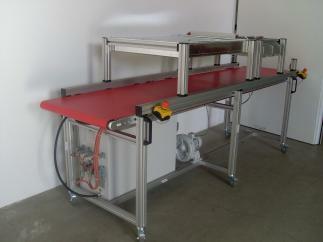 If you are interested in our drying belt, we will be glad to prepare an individual quote for you.